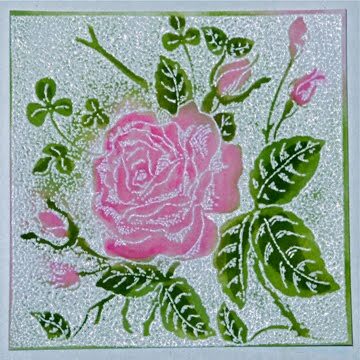 This rose, perfect for a Valentine, is FranticStamper's Cling-mounted Rose Block rubber stamp. It is colored with various Tombow markers and a water brush. Isn't it pretty? Happy Dia De Los Muertos!!! 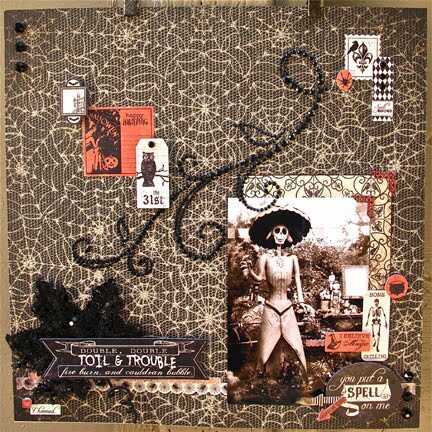 This layout is made using the Authentique Glowing Collection - papers and embellishments, some black rhinestone bling and some black brads. Hi everyone! 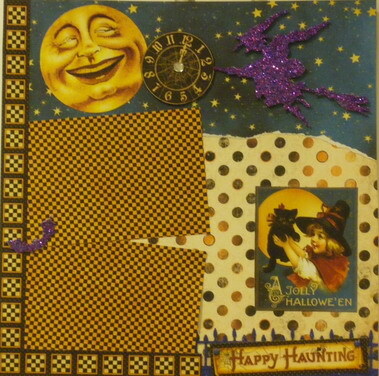 I want to share a scrapbook page that I made using Graphic 45 Happy Haunting (Jolly Jack o Lantern) and Authentique Enchanted (Glowing) Lines carried by Frantic Stamper. I know you love Graphic 45 as much as I do. I love their old fashioned designs - lots of blues and oranges – just lovely! The colors really went well together! Normally when I tear paper I add it to the bottom of my page but this time I added a starry sky. I added my clock and witch with mounting tape and I punched out a spooky fence in blue glitter paper. I hope you like my page. Now for the close-up pictures! Sometimes – in the evening after I have put all our kids to sleep – I feel like creating. It is the best medicine for a tired mind! To just sit down by myself for a few hours before it is time to put myself to bed. I usually just pick out some of my stash and sit down – creating with what I have there. 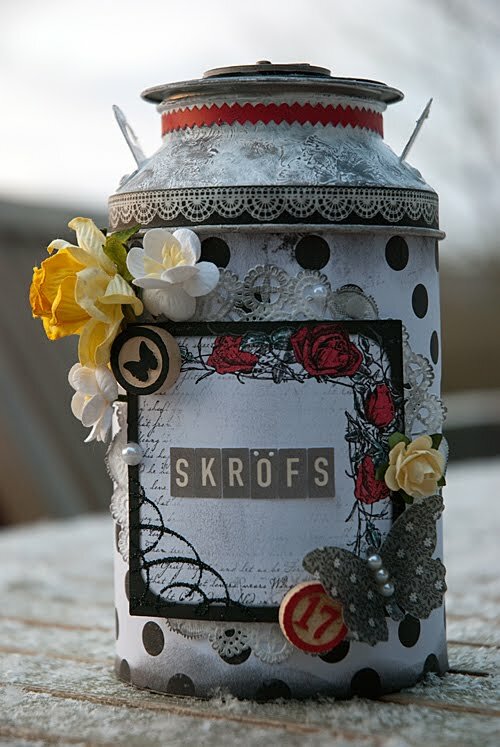 One evening I had Bo Bunny´s collection “Enchanted” on the table, and I finished a tin and a layout in three hours. 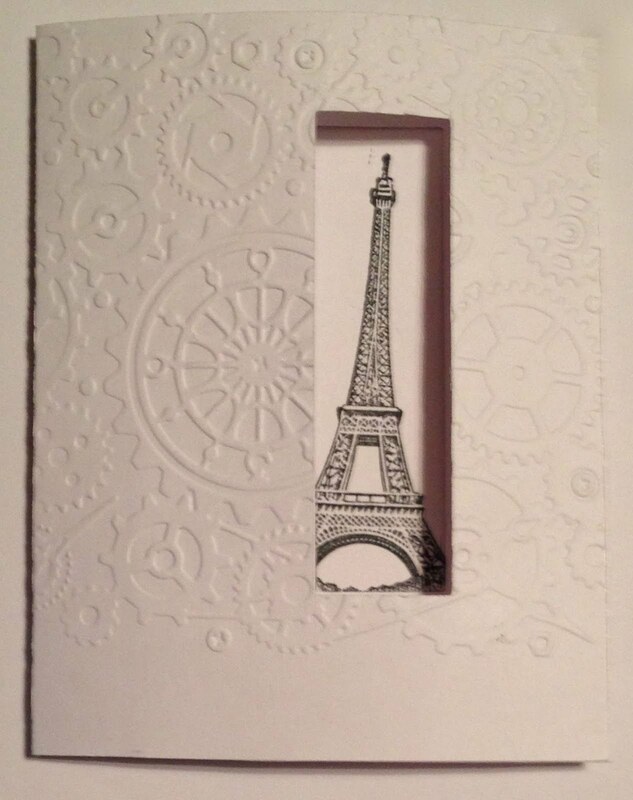 The card was created the morning after – I thought it would be fun to end it all up with a card! 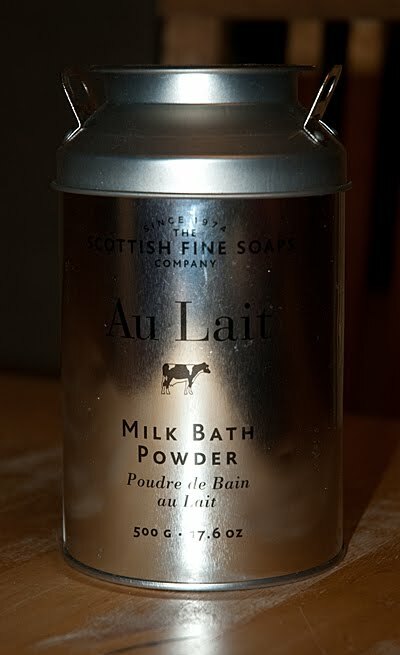 The tin I used was one that had been holding bath salts before. I just LOVE the shape of the tin! I painted it with white Gesso and made it “dirty” with ink. Glued on the paper and after that it was time for the really fun part: decorating! When do you create best? I recently had the opportunity to play around with some of Ranger's Vintaj Patina inks. 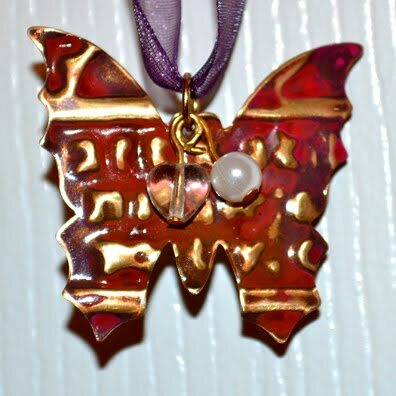 The colors used here are cinnabar, clay, and ruby. These are permanent inks for non-porous surfaces. 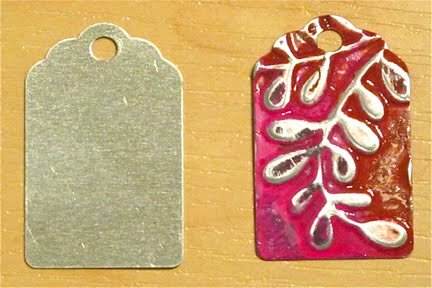 All the videos I watched on YouTube showed using the patinas with the Vintaj line of metal blanks, charms, and embossing folders, none of which I initially had. A friend suggested I cut up an aluminum can to use the inks on. 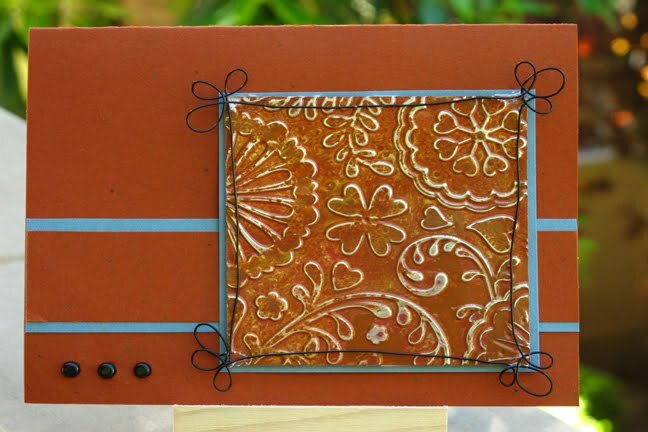 That coupled with my Cuttlebug Floral Fantasy embossing folder, made the base piece so I could use the patinas. There's a bit of a learning curve using the inks. They dry quickly, so you have to work pretty fast to get good coverage on your metal without it getting blotchy. The ideal situation is to have all your lower areas of your metal piece covered with the inks. The higher areas will be the color of the metal (aluminum or brass, etc…), exposed in the process by sanding. The more I played with the inks, the better I was able to achieve the effect I was looking for. Here's another example using aluminum blanks. I also tried the patinas on some metal charms. I finally bought some of the Vingaj brass blanks and by far the best effect was achieved here where I made a necklace with the charm. 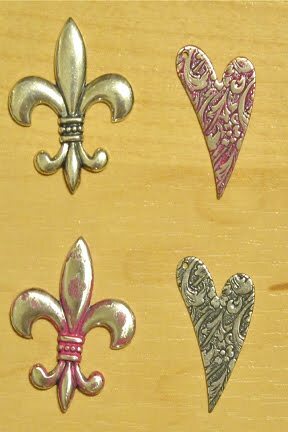 (I used the Sizzix Patchwork Texture Fade for embossing the metal.) This final piece is also coated with the Vintaj Patina Glaze which adds shine and protects the metal and the inks. To chose a winner for our hop, we first ran a random number generator to randomly chose which day our comment would be chosen from: 1, 2, or 3. So, Day 1 it was. Next, we needed to chose from the 13 comments left on that day. Moz, please email Fran at FranticStamper.com with your mailing information, and your choice of series 1 or 2, and she will get your prize out to you. Thanks to all of you who came to our hop and left comments. And thanks to our fabulous design team for all the great samples shared in our hop. Please spread the word about these dies, and get your own at www.franticstamper.com. To celebrate the release of our brand new and incredibly versatile Frantic Stamper Precision Dies we are hosting a blog hop. 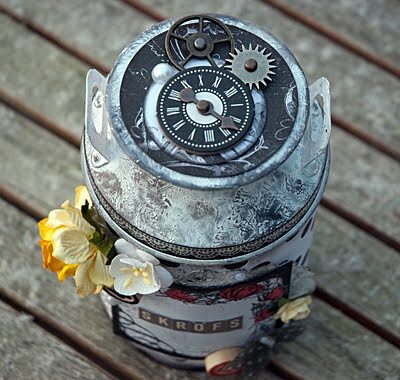 Today is the last day that the members of our design team will be posting projects they have made using the dies (at least as part of our formal blog hop), and sharing a little about their experiences with them. We will also be having some blog candy for one lucky hopper. After you have hopped each day, come back here and post a comment about one of the projects you saw. Tomorrow morning we will randomly draw from among the participants and send that person either set 1 or set 2 of our square dies, winner's choice! 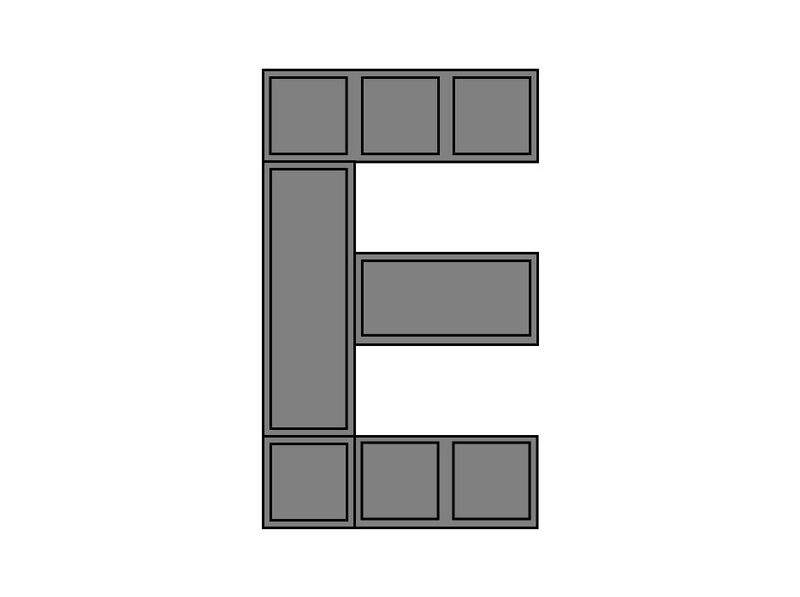 We hope you will think about using these layouts as a starting point for your own alphabet book, or for a special layout like Kathy Berger's Elizabeth page. 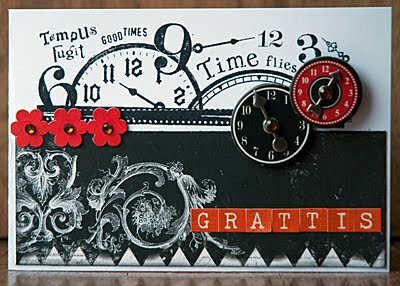 Get your dies at FranticStamper.com, and let the creativity begin! Without further ado, we get the last day of our hop going with a visit to Linda Phinney's blog. Enjoy your hopping! Make sure you come back to leave your comment and have a chance to win! And be sure to check back tomorrow to see who gets a free set of dies. To celebrate the release of our brand new and incredibly versatile Frantic Stamper Precision Dies we are hosting a blog hop. Until Wednesday, members of our design team will be posting projects they have made using the dies and sharing a little about their experiences with them. We will also be having some blog candy for one lucky hopper. After you have hopped each day, come back here and post a comment about one of the projects you saw. On Thursday morning we will randomly draw from among the participants and send that person either set 1 or set 2 of our square dies, winner's choice! Before we get you hopping today we wanted to share a card with you. 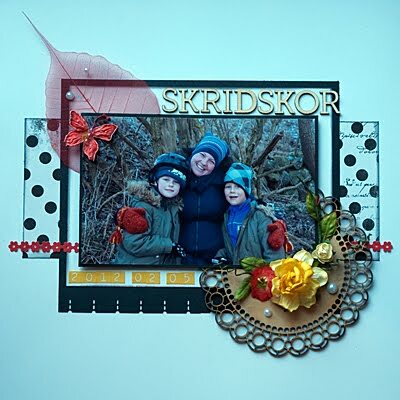 This card is similar to a card Kathy Berger shared on her blog yesterday, but this card is a standard 4-1/4" x 5-1/2" size and uses the 1" Triple Size Rectangle die. We would like to give a shout-out to Dawn Griffith who was the inspiration for this sized card, though we do ours a little differently. 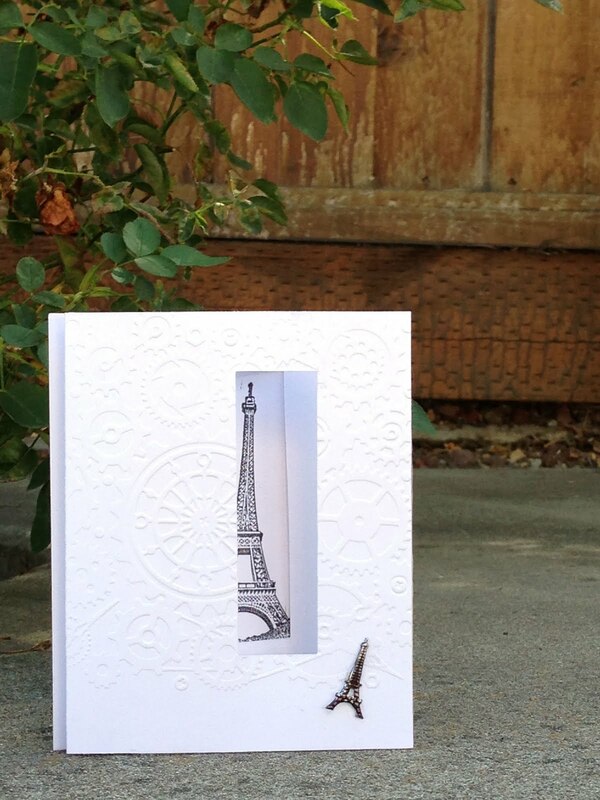 The card is made with three different pieces of sturdy card-stock (the STURDY part is really important for the functioning of the changing image mechanism). 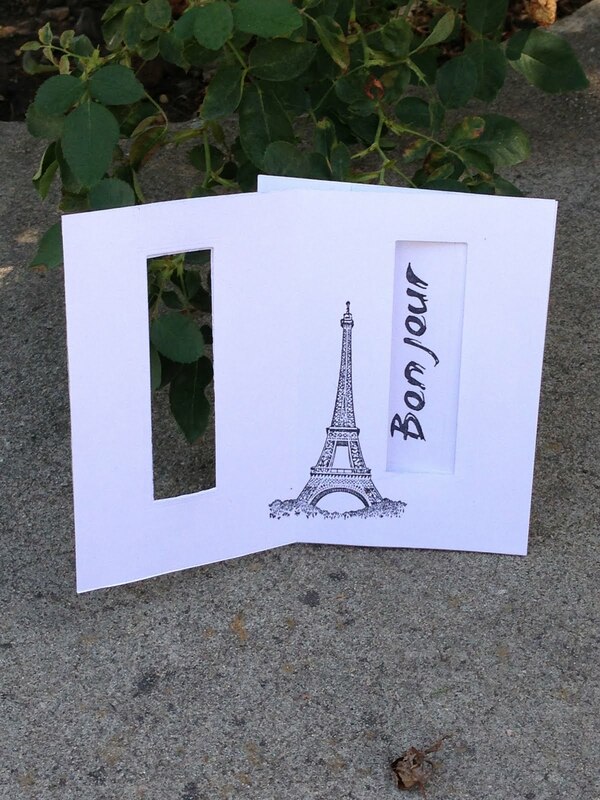 The card front is made from a piece that is 6-1/4"x5-1/2". It is scored at 4-1/4" when in landscape orientation. 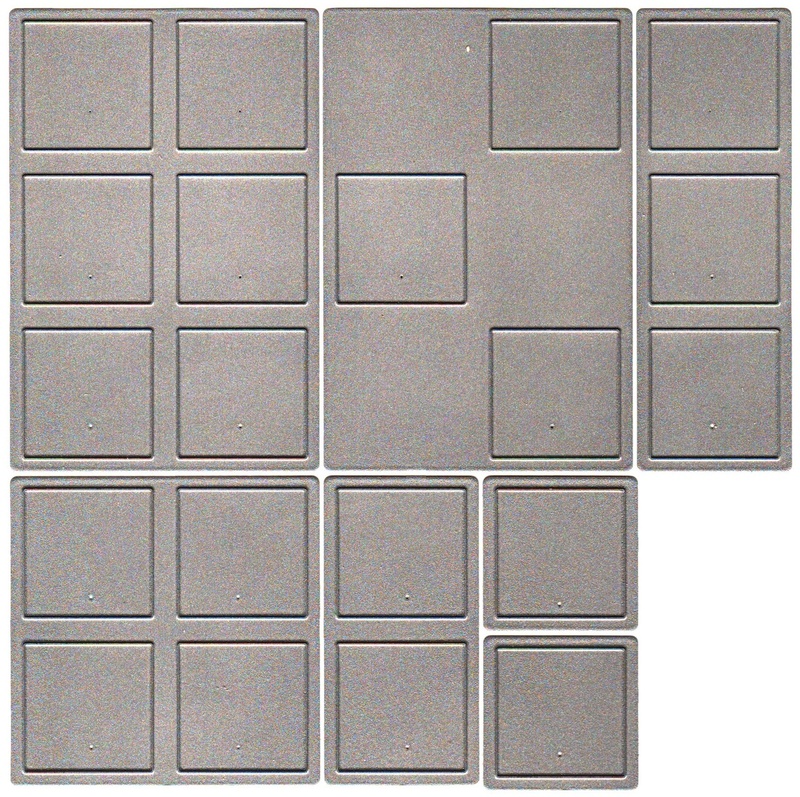 The card center is 7"x5-1/2", and is scored at 3-1/2" in landscape orientation. The final piece, the back, is 4-1/4"x5-1/2" and is not scored. Once the card-stock is scored it should be creased well on the score lines. 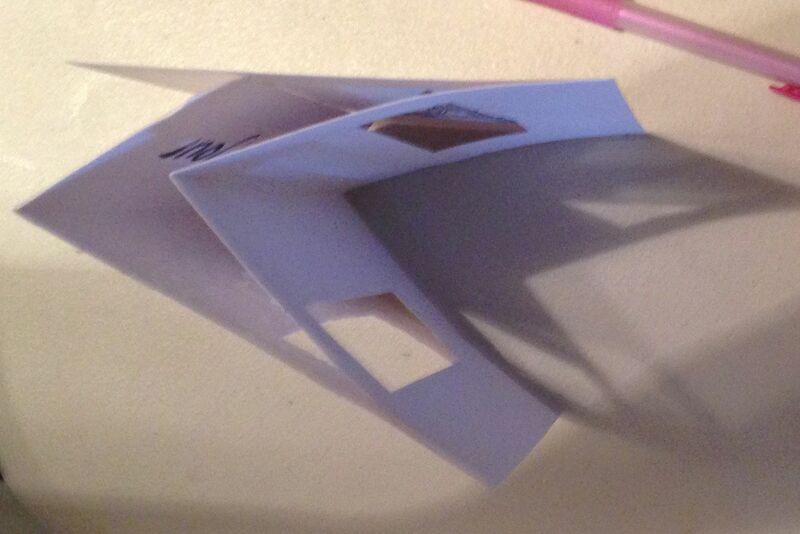 If you want to add texture to the front of the card, do it at this point, taking care not to add texture to the flap. The next steps are to align the card-front with the card-middle and to determine the placement of the die cut. 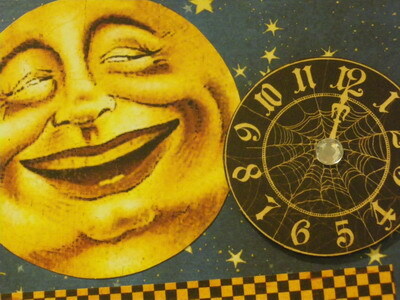 Turn both pieces so that the creases are on the left and so that the card-front is on top. 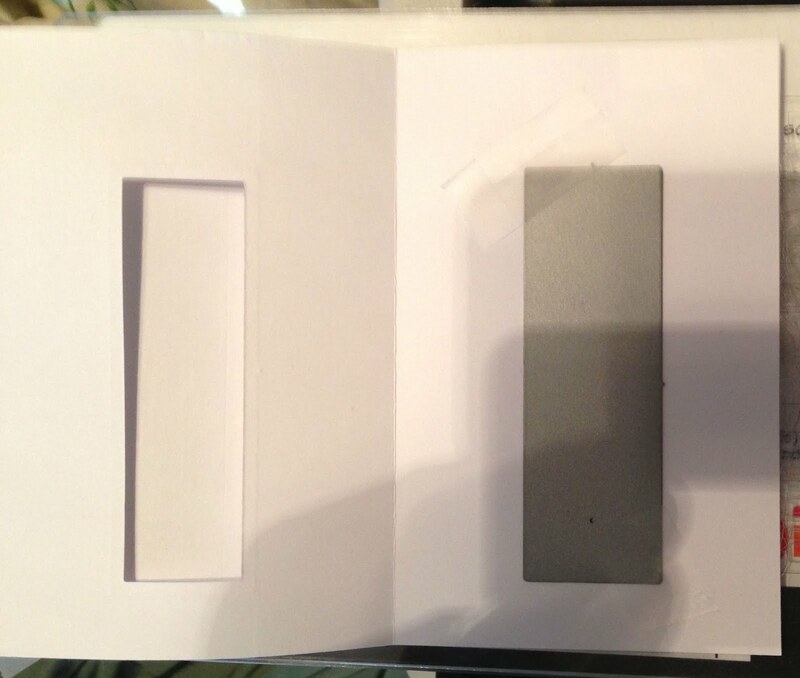 Carefully align the right edges of the card-front and card-middle. Use strong 1/4" tape right along the edge to hold them in that alignment. Now turn the card over. 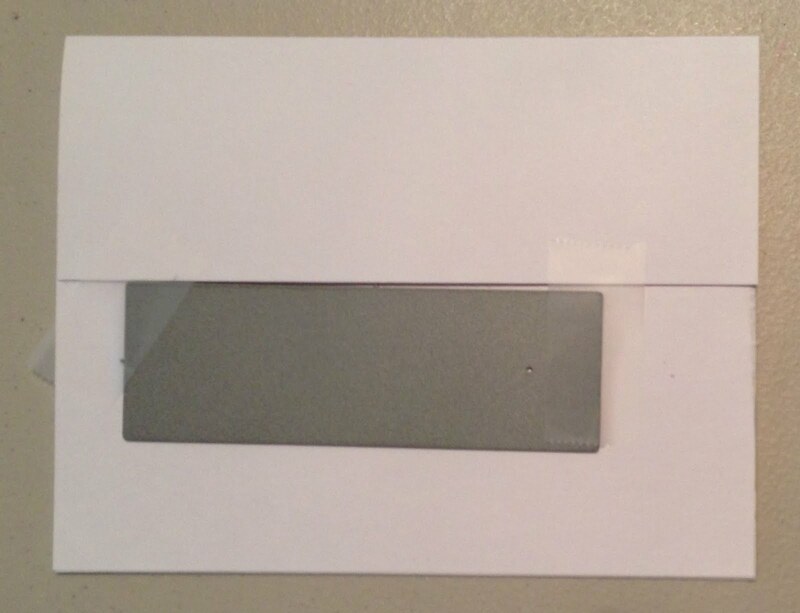 Make sure the flap of the card-front is now on top. Align the die exactly along the edge of the card-front's flap and tape it in place with removable tape, and then run the piece through the die cutting machine. 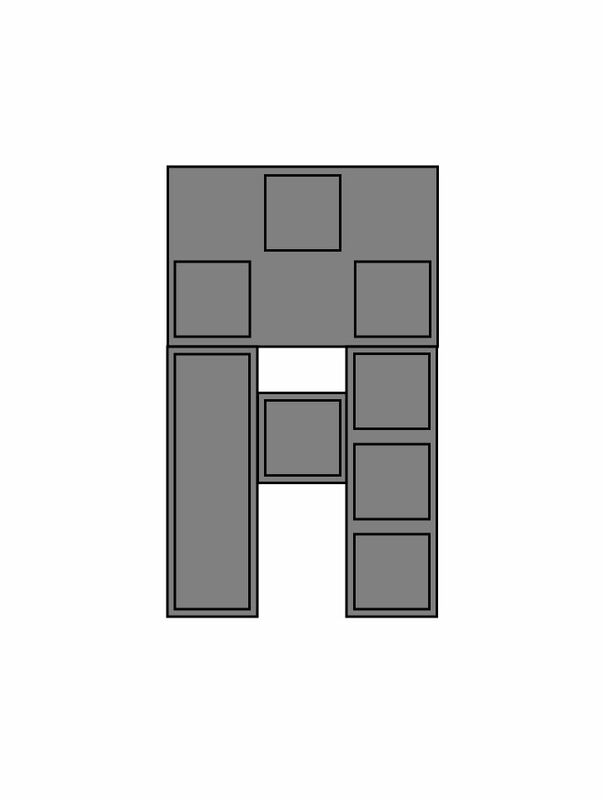 The die should cut through at least two of the layers. If it doesn't cut through all three, though, do not despair! Remove the die from the piece. Open the card-center. Align the die with the holes in the card center piece that is still over the card-front (you can feel when the die align with the holes), and pass through the die cut machine again. Now, to temporarily finish the card mechanism, run a piece of removable tape along the right edge of the card-back and align it with the edge of the card-center, taping them together just on that edge. 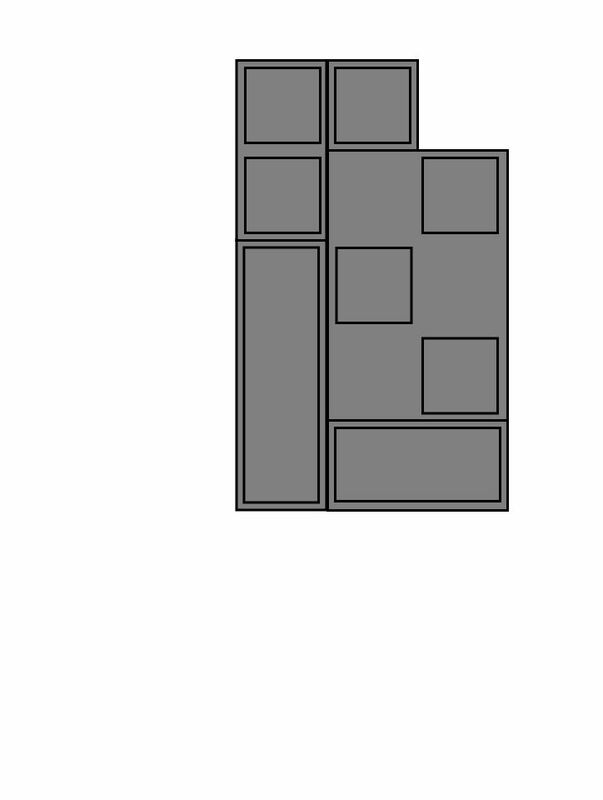 Next you need to place your images for both the closed and open card views. With the card closed, mark where the images should be placed by lightly tracing with a pencil the insides the cut squares onto the inside of the card-back. Take the back off of the card, stamp the desired images into the traced squares, using a stamp positioner if necessary. Carefully erase the pencil lines. Replace the temporary tape with strong permanent tape and re-attach the card-back to the card. Now open the card. Trace the squares again, but this time because of the mechanism of the card, you will be tracing onto the card-front's flap. 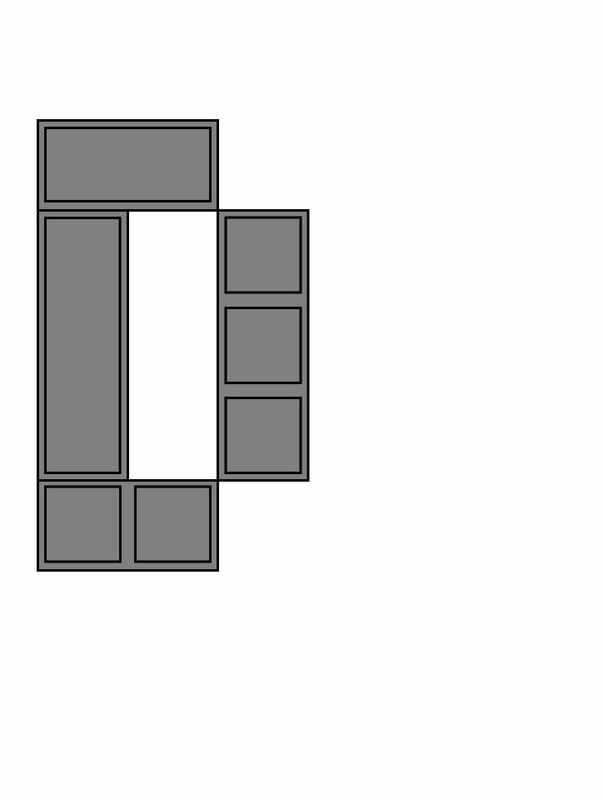 Remove the card front and stamp different images into the traced squares. Again, erase the pencil lines, and replace the temporary tape with strong permanent tape, being careful of the alignment of the edges, but also of the die-cut squares. 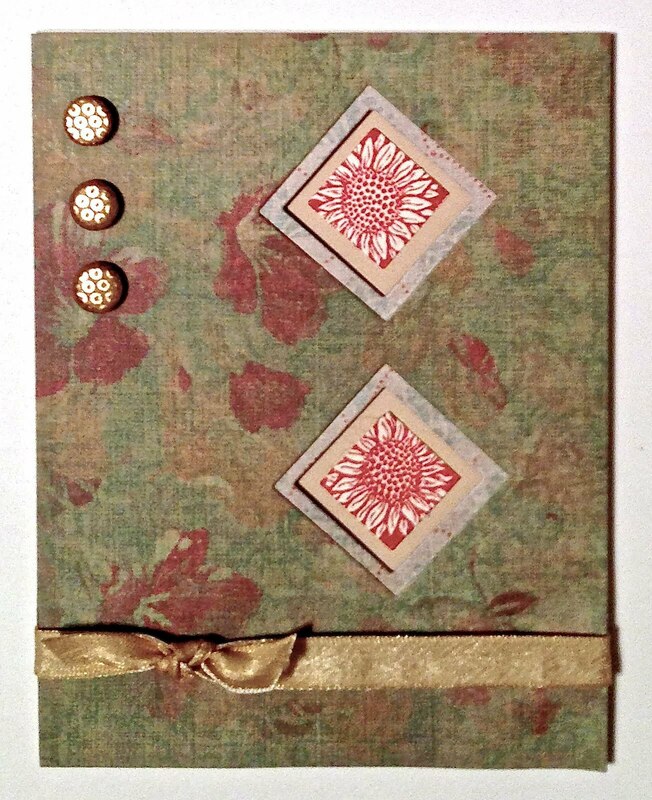 The card is finished except for whatever embellishment you might wish to put on the front. Without further ado, we continue our hop with another visit to Linda Phinney's blog. Enjoy your hopping! Make sure you come back to leave your comment and have a chance to win! To celebrate the release of our brand new and incredibly versatile Frantic Stamper Precision Dies we are hosting a blog hop. Today is the first of three days that the members of our design team will be posting projects they have made using the dies (at least as part of our formal blog hop), and sharing a little about their experiences with them. Before we send you hopping, though we would like to share a technique for creating a matte inside a 1.25" opening using a 1" Single Square die. 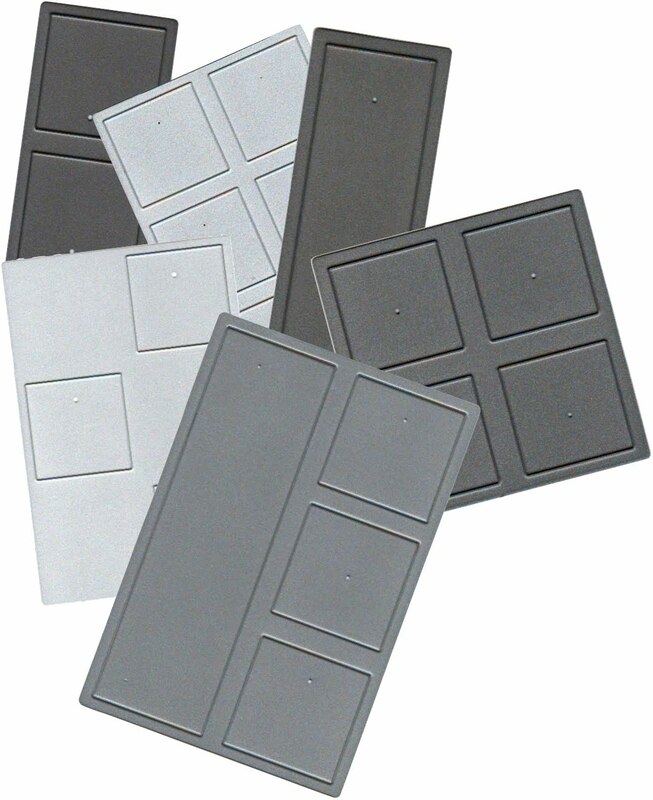 It is a natural that the series that are based on the same sizes work together seamlessly, but these dies have the extra feature that the square holes cut by the 1.25" based dies are the exact size of the 1" Single square die, 1.25"! First cut the main holes with the 1.25" die of your choice from series #2. Then use the holes from that layer as a template for cutting the mattes. Simply place a single into the hole (it is an exact fit!) and tape in place with removable tape, and die cut. If you have only one single, cut one matte hole at a time with multiple passes through your die cut machine. 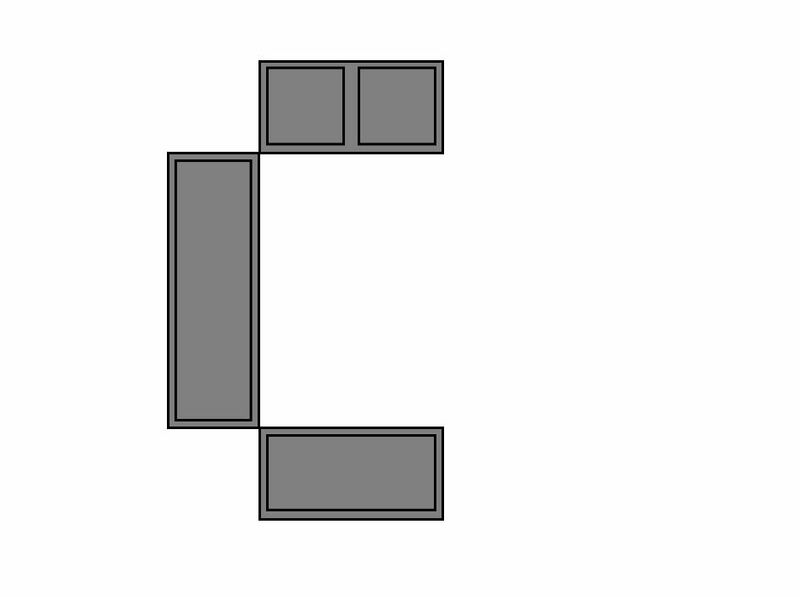 Otherwise, place a 1" Single square into each hole and cut all your mats at once. 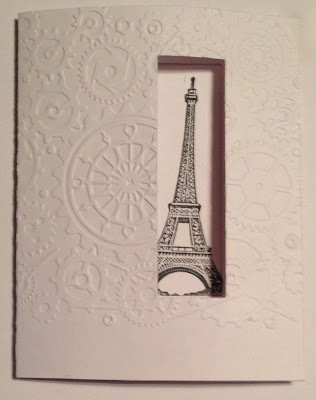 Here is a simple card Kathy Berger made with this technique. We hope you will enjoy it. 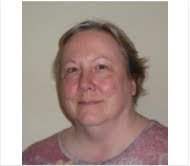 Without further ado, we get the first day of our hop going with a visit to Linda Phinney's blog. Enjoy your hopping! Make sure you come back to leave your comment and have a chance to win! And be sure to check back tomorrow for more hopping! Today is World Card Making Day. 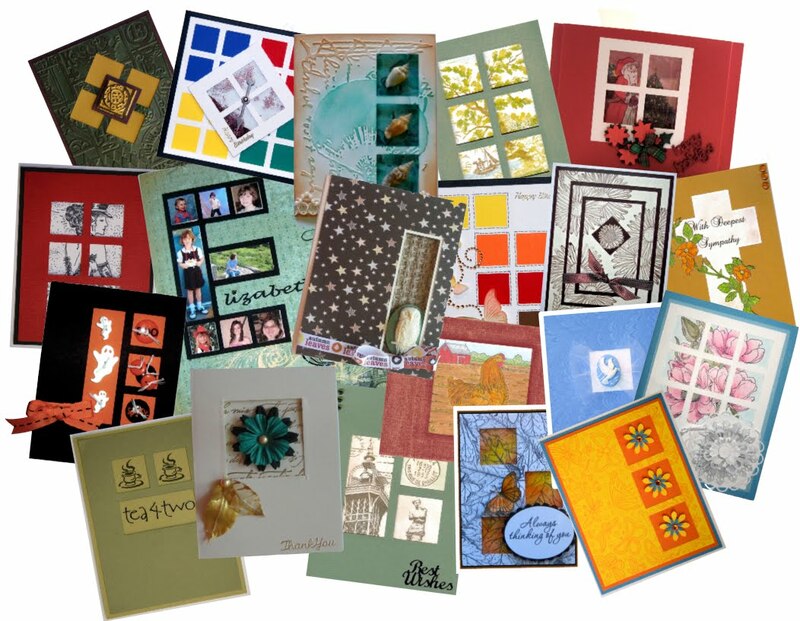 What better way to celebrate than with a little shopping spree for card-making supplies? And what better supply than the brand new Precision Dies from FranticStamper? -no measuring needed; the dies do that work for you. 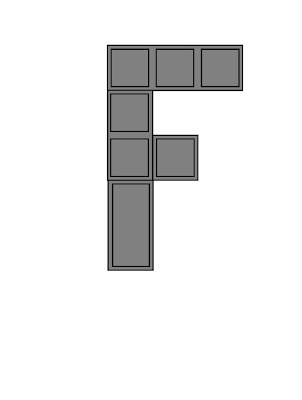 -use the frames as a guide for placement. These dies will be one of the most versatile crafting tools you will own. They are steel ruled, made entirely in the USA. 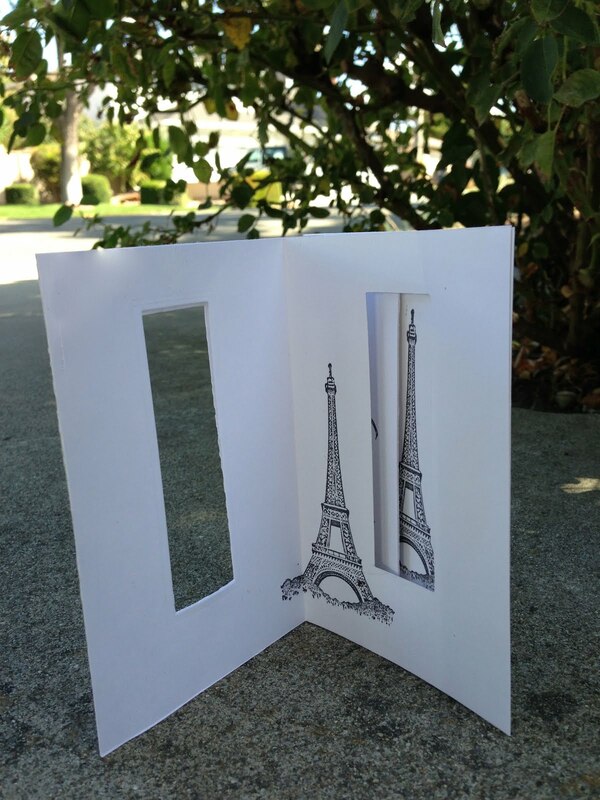 They can cut through card-stock, paper, craft foam, felt and other thin materials like a hot knife cutting through butter! You will LOVE the quality and the design; a great deal of thought went into designing this system of dies, and there is nothing else like it on the market. Get yours now at FranticStamper.com! 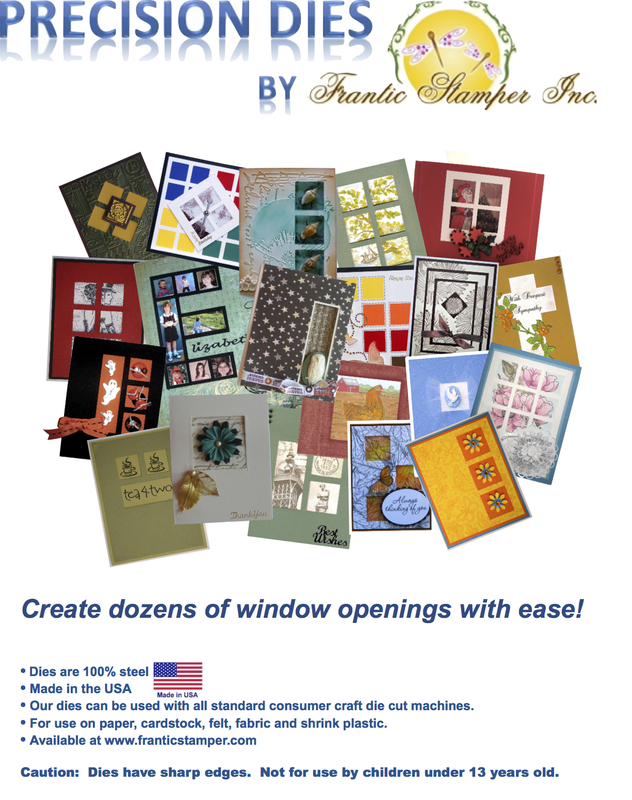 And while you are shopping, don't forget to check out the FranticStamper cling-mounted stamps. 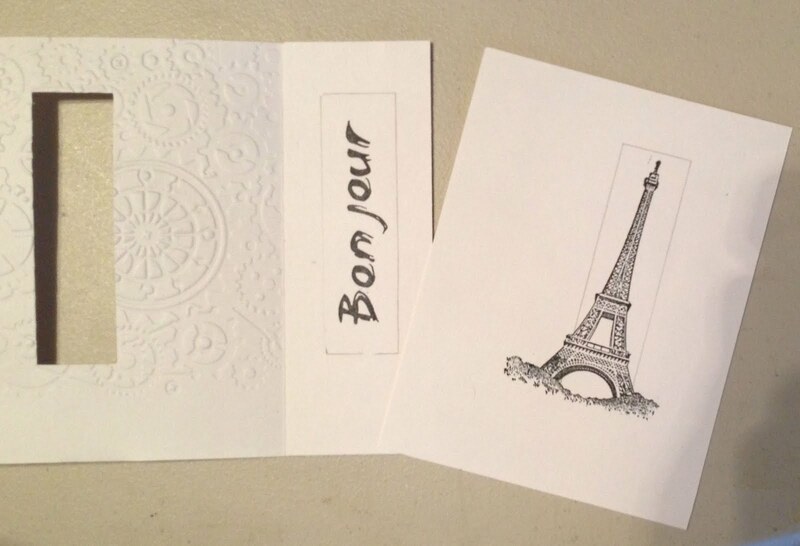 They are French-inspired red rubber stamps mounted on quality cling foam. The line has some really classic images, and even a few risqué images as well. You will The be absolutely thrilled with how beautifully they stamp! Happy World Card Making Day! 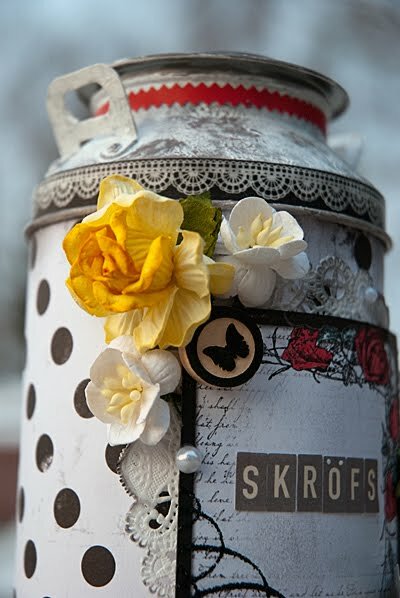 Get shopping, then crafting! 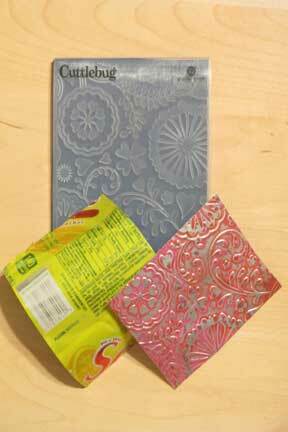 Available in two different base sizes, 1" and 1.25", these dies will expand your creativity!